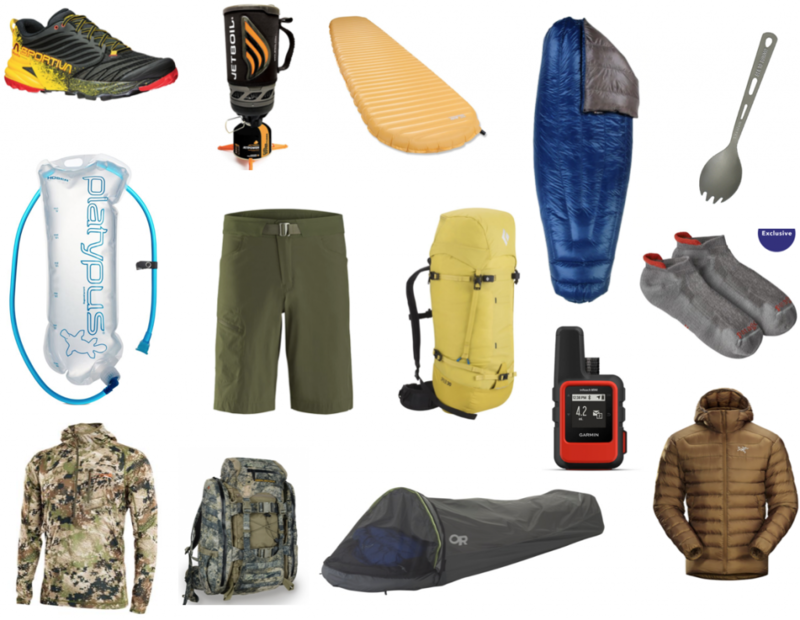 I received an email question this week asking to update my current outdoor gear recommendations. The Below list is what I use/bring for my summer backpacking and summer big game scouting trips. I wear shorts backpacking and/or summer big game scouting. At night/mornings I’ll put on a lightweight pair of long johns. For shorts, I recommend nylon, not polyester. It’s more durable and dries faster. My current favorite short is the Arcteryx Lefroy Short. I wear a lightweight pair of long johns to sleep and for the evenings/early mornings. I have a couple pair of old Patagonia Capiline Lightweight Long Johns, but am not partial to any brand. Just go lightweight and synthetic. Underwear? Outdoor Research Echo Boxer Briefs are hard to beat. No matter the duration of the trip, I don’t bring an extra pair of underwear. Gross, I know…. Pants? Rarely do I wear pants backpacking or for my summer scouting. But sometimes I’ll wear Arcteryx Gamma LT pants, which are made from nylon, super durable, and dry fast. When it’s hot I’ll roll up the bottoms to just below my knees, making them into knickers or “capri” pants. Not manly, I know, but it’s amazing how much cooler you feel when your calves/shins can breath! I prefer a synthetic long sleeve top for summer backpacking. I find long sleeves keeps me cooler. Even better is a lightweight sun hoodie. Especially when big game scouting, I’ll spend a lot of time in the sun, stationary, glassing for game – and I’ll put the hood up over my ball cap – which makes a huge difference in keeping me cool. For a simple long sleeve, synthetic sun protection, nothing works better or is cheaper than a light gray A4 long sleeve performance crew ($8). I can’t seem to find a sun hoodie near as cheap – and currently wear either a Sitka Gear Core Lightweight Hoodie or an Outdoor Research Echo Hoodie. But … any sun hoodie will work, and multiple brands make them – including Under Armor. Fit is important – you don’t want it too tight, so if you know how a brand fits you, buy it’s sun hoodie. Know I don’t bring another top, and can get smelly …. A note on Merino – I don’t like merino for hiking/scouting/hunting other than socks (see below). I’ve found it simply does not dry as fast as synthetics. Last year I killed a bull elk near dark in late September, and it was 11pm by the time I made it back to my truck with the first half of boned out meat in my pack. It was below freezing in the creek bottom where my truck was, and when I arrived I was sweaty. I’m small enough to sleep in the back seats of my truck, and it was midnight by the time I’d eaten dinner, and stowed all my gear. I’d worn a merino camo base layer and hoodie, but still wasn’t dry from sweat when I layed down to sleep. I spent the first 30 minutes in shivering myself dry before I could sleep. This has never happened wearing synthetic clothing. I prefer a medium to heavy weight fleece hoodie as my second layer, and a lightweight puffy hoodie as my 3rd layer. I double up my camo Sitka Gear Core Heavyweight Hoodie for both backpacking and summer scouting. This is an expensive piece, and nearly every outdoor clothing manufacturer has something similar and cheaper – shop around. Get a pull over, however, with a deep zip, over a full zip. The Outdoor Research Shiftup Hoodie will work and is on sale now. I prefer a lightweight down or synthetic puffy hooded jacket as the 3rd layer. In my pack now is the Arcteryx Cerium LT Hooded Jacket. Aim for a hooded jacket that weighs less than 13 ounces. Most gear manufacturers make these. A relatively new product offered now is “active insulation” which combines the benefits of fleece and an insulated hoodie in one piece. These are synthetic hooded puffy jackets which are air permeable and breath. I haven’t tried one of these yet, but it may be possible to find a lightweight, active insulation layer which could replace both the fleece hoodie and non-active insulated puffy like my down one above. I may test this system this year. If I’m expecting warm weather, I will leave my down jacket at home and just bring my fleece hoodie. I never leave the trailhead without my Outdoor Research Helium II Jacket in my pack. Six ounces, fully waterproof and cheap. Can’t beat it for lightweight, wind protection, and rain protection if needed. I prefer merino wool, ankle-high socks. I’ll wear one pair, and bring another in my pack in case my feet get wet during the day and I need a dry pair to sleep in. I’ve had great luck with Patagoinia’s Anklet Lighweight Performance Socks. Look for them on sale. Any ball cap will do. Because of my sun hoodie, fleece hoodie, and puffy hoody, I don’t need to bring a warm hat. For gloves, I wear cheap ($2) acrylic gloves you can pick up at the grocery store in the winter. These are light, warm, and just enough for summer hiking/backpacking. I like trail runners for summer backpacking/scouting. My current favorites are La Sportiva Akasha trail runners. These are almost as cushioned as the Hoke One One Speed Goats (my second favorite), but have much better tread and much better lateral support. I’ve worn these hunting, as well. Order them a 1/2 size big to allow for swelling. This time of year, it’s easy to find these shoes on sale. I’ve found the smaller your pack, the less unnecessary stuff you take. For backpacking, I won’t go over a 30L pack, and it’s hard to beat the Black Diamond Speed 30 pack for up to week long backpackping trips. This pack is super simple, and light (sub 3 pounds). But, because of the binoculars, spotting scope and tripod I need to bring, the Speed 30 is a little small for summer big game scouting trips. For these I really like the Elberestock X2 Pack. It’s heavy and overbuild, but also has perfect pockets to stowe my spotting scope, tripod and hydration bladder. I’ve had my current X2 pack for 5+ years, and it’s beginning to show some wear … darn it! Ninety-five percent of the time I’ll choose a bivy sack over a tent. Once you start using a bivy sack, you’ll find the hassle of finding a flat spot for, and setting up a tent too much to bear! My bivy sack of choice is the Outdoor Research Helium Bivy. It’s cheap, light (less than 1 pound) and has kept me dry in many a short night time rain shower. As well, the bivy sack adds 10-15 degrees of warmth to your sleep system. For than 5% of the time when weather threatens and I need a tent, I take a Tarptent Notch. This is a trekking pole tent (I use trekking poles), weighs less than two pounds, and is bomber in wind and bath weather. I use a quilt, instead of a sleeping bag, specifically the 20-Degree Enlightened Equipment Revelation Quilt. I’ll wear my Fleece Hoodie, with hood up to sleep, and this quilt, and Helium Bivy keep me plenty warm. It weighs less than a pound. Sleeping Pad – Thermarest NeoAir Xlite. Super comfy, warm and light. However, I’m having to send my current pad back due to a leak around the blow tube. I’ll get another. It’s hard to beat the Jetboil Flash Cooking System. Last year I tried the MSR Pocket Rocket, which is a few ounces lighter, but went back to my jetboil because it heats water a little faster and doesn’t need a match or lighter to ignite. However, both are bomber and good choices. I bring along a Snow Peak titanium spork. I’ve had several plastic sporks break in the past, and the $10 for this spork is worth the money. Breakfast and lunch are generally a ProBar Meal Replacement Bar, and I’ll have a Mountain House freeze dried meal for dinner. Between meals I’ll eat GU Stroopwafels – which offer about the most calories per ounce out there, and aren’t as messy as gels. I’ll pack 4x Stroopwafels per day. I use as Platypus Hydration Bladder for my water, and Katadyn Micropur tablets to purify my water. These are easy, tastless, and a bunch less complicated than any filtration system I’ve found. I’m big on coffee in the backcountry, and my goto are Starbucks Columbia Via instant coffee packets. For a Cup I bring a long a collapsible silicone Sea to Summit Xcup. It’s amazing what a jolt of caffeine will do for your energy and spirits in the middle of the afternoon on a hot day, 10 miles from the trailhead! During the day I’ll just make cold brew. In the evenings and morning, I’ll heat up some water for my coffee. I pack 4 Via packets per day.